The spiritual master formally accepts a disciple through the process of diksha or initiation. The ceremony marks the beginning (initiation) of a relationship that then needs to be nurtured and cultivated. 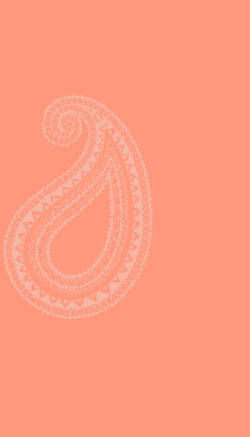 One should clearly understand that initiation is the 'beginning' of a journey, not an end in itself. Persons who simply take initiation without maintaining further contacts with the spiritual master are not really disciples. As soon as the disciple consciously begins to commit offenses at the lotus feet of the spiritual master, at that moment the spiritual master-disciple relationship is automatically broken. Just as a seed requires fertile soil and regular watering to germinate, the potent instructions of a bona-fide spiritual master can only take root in the heart of a sincere disciple. The basis of this relationship is trust. The spiritual master takes on the great responsibility of guiding the disciple on the path of spiritual realisation with the understanding that the disciple will follow his instructions. The disciple submits to the instructions of the Guru understanding that they are for his/her ultimate spiritual benefit. When such a two way trust is established, then and only then does a bona-fide spiritual master-disciple relationship exist. 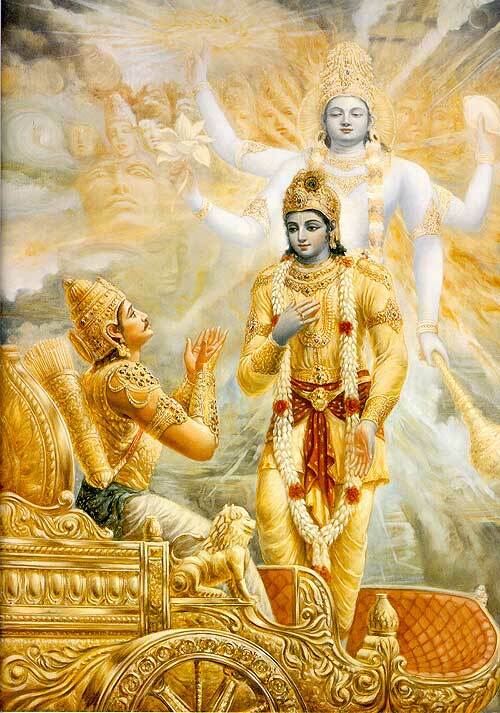 The fundamental qualities of a disciple are spoken by Sri Krishna in the Bhagavad-gita (4-34). "Try to learn the truth by approaching a spiritual master Inquire from him submissively and render service unto him. The self realized souls can impart knowledge unto you because they have seen the truth." Here, Sri Krishna gives the two basic characteristics of a genuine disciple: submission and service attitude. The word disciple is derived from 'discipline.' Thus a disciple is one who submits to the discipline enforced by the spiritual master. Submission is practiced by surrendering to the instructions of the spiritual master. For instance, if the Guru wants the disciple to follow certain regulative principles, then the disciple should submit to these instructions and strictly follow the regulative principles. A disciple should never be proud of his material qualifications like education, bodily beauty, wealth, high birth or position. Such qualifications have little or no meaning in spiritual life. In fact, they may even have an adverse effect like a heavy gold crown on the head of a drowning man because they may increase the false pride of a prospective disciple and obstruct his spiritual advancement. So a disciple should never present his material qualifications in front of the spiritual master. The submissive attitude should be prominent during inquiry. Even the most learned person should present himself humbly before the spiritual master, for the simple reason that the spiritual master is infinitely more advanced in realization. 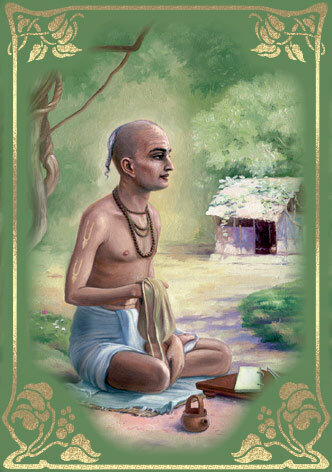 When Rupa Goswami, a literary genius of his time was present before Chaitanya Mahaprabhu, he lamented that he was in a state of great ignorance because not only because others considered him learned, but because he actually believed what others said. Chaitanya Mahaprabhu pleased by this submission of Rupa Goswami then instructed him in great detail about the science of devotion. The Guru is never dependant on the disciple for any help, support or aid. He is always under the protection of Krishna. However when he sees a sincere disciple desiring to make progress, then mercifully he provides him with an opportunity to render some service according to his propensity. When the spiritual master gives some service to the disciple, it should be understood that it is only for the betterment of the disciple, to help him advance on the spiritual path. In the Bhakti-Rasamrta Sindhu, Srila Rupa Goswami explains that all activities under the control of the external or material energy, Maya, will result in good or bad karmic reactions, and bind one to the cycle of birth and death. However activities done under the instructions of the spiritual Guru are under the internal or spiritual energy of Krishna and therefore are considered to be pure devotional service. Thus by definition, devotional service is any activity performed under the instructions of the spiritual master. It is the duty of the disciple to inquire from the spiritual master about matters concerning God and divinity. A disciple who does not inquire from his spiritual master is not fulfilling his role as a disciple. The scriptures are full of knowledge, but they need to be interpreted according to time, place and circumstance. In response to specific inquires from the disciple the Guru applies these scriptural injunctions in a manner best suited for his specific circumstances. Inquiry thus forms the basis of instructions; these instructions become the basis of surrender and surrender the basis of spiritual advancement. The spiritual master guides the disciple to make them competent in dealing with spiritual matters. The spiritual master is glorified by the disciple as, "I was born in the darkest ignorance, and my spiritual master opened my eyes with the torch of knowledge." So the Guru opens the eyes of the disciple, however he does not become the eyes of the disciple. The primary focus of dependence of the disciple on the spiritual master is for guidance and instructions, not for solutions, especially for mundane problems that do not have a direct bearing on one's spiritual life. "Only unto those great souls who have implicit faith in both the Lord and the Guru are all the imports of Vedic knowledge automatically revealed." The faith described herein is not simply intellectual agreement on some theological matter. Rather, the disciple must completely surrender himself as the servant of the spiritual master and take up the spiritual master's instructions as his life's mission. The transcendental knowledge of Godhead is never revealed to the speculative or mundane vision. It is only visible by eyes of faith and devotion. Of course this does not mean that the disciple relinquishes his ability to think. Quite the opposite. The scriptures enjoin that anything should only be accepted if it is independently verified by Guru-Sadhu-Shastra, that is the spiritual master, the self-realized devotees and the scriptures. However once a disciple accepts an instruction, then there is no room for doubts or hesitancy. The Guru takes full responsibility for the sincere disciple and acts as the disciple's savior. He alone can impart Divine knowledge and thus lead him to liberation. The disciple therefore owes a debt to his spiritual master, who has personally lifted him out of conditioned ignorance and blessed him with the perfection of eternity, bliss and knowledge. The disciple can never repay or even attempt to repay this debt. However it is incumbent that he acknowledges this debt by trying to serve the spiritual master to the best of his ability. Offenses at the lotus feet of the spiritual master are much more serious than Vaishanava apradha and can destroy one's spiritual life completely. Even if the Guru does not take offense, Krishna does not tolerate offenses against His devotees and will undoubtedly punish the offender. Thus one has to treat every exchange with the spiritual master with great care and understanding that the survival of one's spiritual life is at stake there. The relationship between disciple and Guru is transcendentally sweet and mellow. It is one of mutual love and service. The disciple serves the spiritual master by rendering menial service, following his instructions and in his turn, the spiritual master executes his duties humbly as a servitor of the Supreme Lord and of his own spiritual master in the disciplic succession. The Guru is the ultimate benefactor of the disciple, since he delivers him from material nescience and this should be the constant meditation of the sincere disciple.